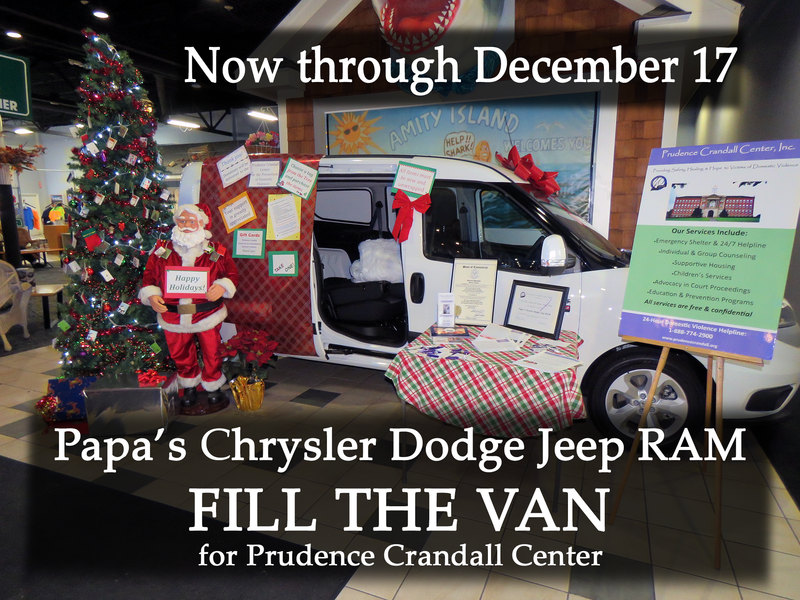 For the third year in a row, Papa’s Chrysler Dodge Jeep RAM is having a ‘Fill the Van’ donation drive to support Prudence Crandall Center! The outpouring of support from their staff and customers has been amazing, resulting in the delivery of a van-load (or two!) for our families just in time for the holidays. The donations, gifts and household essentials that are collected help our families get established as they begin new lives, free from violence. Many of the essentials are also used to welcome victims and families into our emergency shelter every year. Too often, individuals and families fleeing an abusive home leave most of their belongings behind. And for low-income families facing a time of crisis, the holidays can be particularly stressful. These donations let them know that the community supports them, and they are not alone, as they make that brave first step towards a safe and brighter future. The donation drive will run until December 17. Make sure to follow us on Facebook to see the big delivery arrive on December 18th!